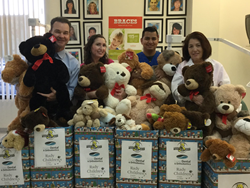 Coast Dental and SmileCare dental offices in San Diego partnered with the 25th Annual San Diego Regional Law Enforcement Teddy Bear Drive to collect teddy bears for Rady Children’s Hospital. SmileCare orthodontist Dr. Geoffrey Kopecky, left, spearheaded the donation effort at nine SmileCare and Coast Dental locations. This is just one more way we can help people smile. The dentists, hygienists, and team members at Coast Dental and SmileCare helped more children than ever smile this holiday season. They teamed up with their patients to collect 450 teddy bears to donate to Rady Children’s Hospital as part of the 25th annual San Diego Regional Law Enforcement Teddy Bear Drive. The stuffed animals will be given to sick and injured children around Christmas and throughout the year. "We care, we serve, and we give back to our communities," said Dr. Kopecky. "This is just one more way we can help people smile." Recognized as “Top Doc San Diego” by Channel 5 Fox News, Dr. Kopecky offers complimentary orthodontic consultations to patients who would like to know if braces or invisible aligners could help them have a straight, healthy smile. SmileCare and Coast Dental also offer family dental services, emergency dental services, and specialty dental services. To learn more, call 1-800-32-SMILE or visit SmileCare.com or CoastDental.com. SmileCare Coast Dental of California, Dental Group of Adam Diasti DDS PC (Adam Diasti, DDS, Lic. 60596), with its professional associations, is one of the largest providers of general and specialty care in the United States with 175 affiliated practices operating as Coast Dental and SmileCare in Florida, Georgia, California, Nevada and Texas. SmileCare offers family dentistry services and orthodontics at all of its California locations, plus many offices offer pediatric dentistry, oral surgery, endodontics, and periodontics. SmileCare accepts more than 200 types of insurance, and has special offers for patients without insurance. Free braces consultation: BRCON. ADA D9310. Save $126. Minimum fee only. Fee may vary with complexity of case.To find a location or request an appointment, call 1-800-32-SMILE. Coast Dental Services, LLC is a privately-held practice management company that provides comprehensive, non-clinical business and administrative services to its affiliated practices. The company is headquartered in Tampa, Florida. For more information, visit CoastDental.com.